The Methodist movement traces its origin to the evangelical awakening in 18th century Great Britain. Methodism followed from the work of John Wesley, who was an Anglican clergyman. John Wesley (1703–1791) was an Anglican cleric and Christian theologian who was the founder of the (Evangelical) Arminian Methodist movement. The Methodist revival originated in Epworth, North Lincolnshire, England. It began with a group of men, including John Wesley and his younger brother Charles, (sons of an Anglican parson) as a movement within the Church of England in the 18th century. The movement focused on Bible study and a methodical approach to scriptures and Christian living. The term “Methodism” was initially a pejorative term given to a small society of students at Oxford University, the “Holy Club”, who met together between 1729 and 1735 for the purpose of mutual improvement. They were accustomed to receiving communion every week, fasting regularly, and abstaining from most forms of amusement and luxury. They also frequently visited the sick and the poor, as well as prisoners. The early Methodists acted against perceived apathy in the Church of England, became open-air preachers and established Methodist societies wherever they went. These societies were made up of individual classes – intimate groups where individuals were encouraged to confess their sins to one another and to build each other up. They also took part in love feasts which allowed for the sharing of testimony, a key feature of early Methodists. Methodist preachers were notorious for their enthusiastic sermons and often accused of fanaticism. In those days, many members of the established (Anglican) church feared that new doctrines promulgated by the Methodists, such as the necessity of a New Birth for salvation, of Justification by Faith, and of the constant and sustained action of the Holy Spirit upon the believer’s soul, would produce ill effects upon weak minds. Theophilus Evans, an early critic of the movement, even wrote that it was “the natural tendency of their behaviour, in voice and Gesture and horrid Expressions, to make People mad.” In one of his prints, William Hogarth likewise attacked Methodists as “enthusiasts” full of “Credulity, Superstition and Fanaticism.” But the Methodists resisted the many attacks against their movement. Although “Methodism” in Great Britain today is commonly taken as “Wesleyan Methodism”, there were various Methodist denominations, until the final Deed of Union which, on 20th September 1932, brought together the Wesleyan Methodist Church, the Primitive Methodist Church and the United Methodist Church, to form the denomination formally known today as the Methodist Church of Great Britain. Wesley sought to keep Methodism as a revival movement within the Church of England, and a significant number of Anglican clergy were known as Methodists. However the movement developed as a separate denomination after John Wesley’s death. Early Methodists were drawn from all levels of society, including aristocracy. But the Methodist preachers took the message to labourers and criminals who tended to be left outside of organised religion at that time. 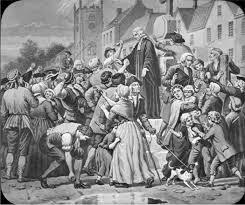 Initially, Wesley himself thought it wrong to preach outside a Church building until persuaded otherwise by Whitefield! Methodism in both forms was a very successful evangelical movement in the United Kingdom. Wesley was a brilliant organiser and formed societies throughout England, Scotland, Wales, and Ireland. He divided his religious societies further into classes and bands for intensive accountability and religious instruction. His great contribution was to appoint itinerant (unordained) preachers who travelled widely to evangelise and care for societies. Through vigorous missionary activity Methodism spread throughout the British Empire, the United States, and beyond to Asia (Singapore, South Korea and many others. 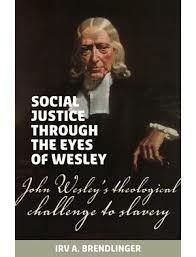 Methodists, under Wesley’s direction, became leaders in many social justice issues of the day including prison reform and abolitionism movements. Wesley’s contribution as a theologian was to propose a system of opposing theological stances. His greatest theological achievement was his promotion of what he termed “Christian Perfection,” or holiness of heart and life. Wesley insisted that in this life, the Christian could come to a state where the love of God, or perfect love, reigned supreme in one’s heart. His evangelical theology, especially his understanding of Christian perfection, was firmly grounded in his sacramental theology. He continually insisted on the general use of the means of grace (prayer, Scripture, meditation, Holy Communion, etc.) as the means by which God transformed the believer. Throughout his life, Wesley remained within the Church of England. His maverick use of church policy put him at odds with many within the Church of England, though toward the end of his life he was widely respected. He was banned from preaching in Anglican churches but remained an Anglican all his life and insisted that his movement was well within the bounds of the Anglican Church. During his lifetime Methodism was a ‘movement’, not a separate church. In his lifetime he is said to have preached over 40,000 sermons. The Wesleys were an influence in prison reform and, inspired by Susanna Wesley, (their mother), they earned a reputation as pioneers in education. John Wesley himself wrote, edited or abridged some 400 publications. As well as theology he wrote about politics, music, marriage and slavery and medicine. Despite an increasing level of income, he always lived on £28 a year, and gave the rest away. It is estimated that during his life he gave away £30,000. He travelled about 5,000 miles a year. mostly on horseback. He preached in streets and fields to anyone who would listen, but mostly to ordinary, humble working people, avoiding the rich. He believed that God loves every man, woman and child, and wants them to be good. One of our Church members has in his possession a genuine letter from John to one of his ancestors who lived locally. The letter has been exhibited at national exhibitions in London. In the 1960s, the Methodist Church of Great Britain made ecumenical overtures to the Church of England, aimed at church unity. Formally, these failed when they were rejected by the Church of England’s General Synod in 1972. However, conversations and co-operation continued, leading on 1 November 2003 to the signing of a covenant between the two churches in the presence of HM the Queen. The Covenant puts the two Churches on a path of ever deepening relationships and mutual trust and co-operation on the road to a richer unity involving all who call themselves Christ’s disciples.